Iapetus is the third largest moon of Saturn. The low density indicates that it is mostly composed of ice, with only a small (~20%) amount of rocky materials. Recently, a large number of long-runout landslides (~30) have been identified (Singer et al., 2012). Three morphological indicators aided the identification of these landslide deposits. First, the landslides themselves often had a distinct surface texture compared to the surrounding terrain; either hummocky (called blocky type landslides, see Image 2) or relatively smooth and uncratered (called lobate, see Image 3). Second, landslide frontal or lateral margins often appear as a distinct border, and in some cases these margins are quite steep. Third, the landslides are often associated with an adjacent alcove on the crater wall or structural ridge from which they fell. These landslides occur in smaller craters, large impact basin rims (rising higher than 10 km in some cases), and from the unique equatorial ridge (rising up to 20 km; see Image 4). Landslides on Iapetus are the largest and most numerous observed on any icy body, and they rival the longest runout landslides seen elsewhere in the Solar System (up to 80 km). 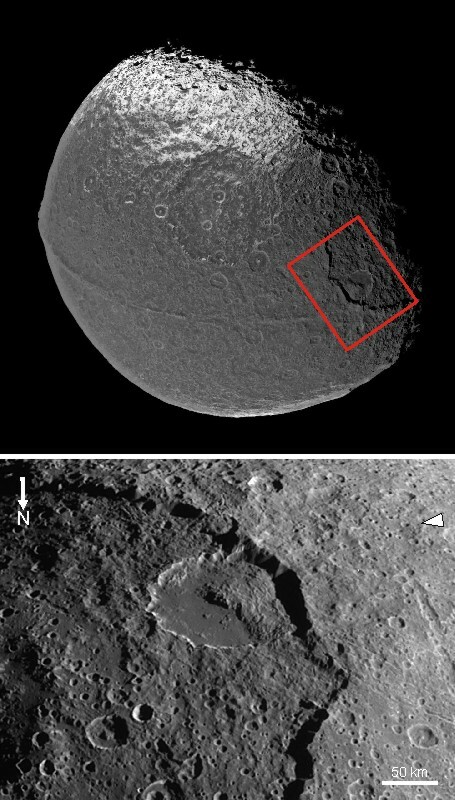 So, why are there so many landslides on Iapetus? One important factor is the extreme topography. It is the largest for its size, of any major body in the Solar System. The antiquity of the surface also plays a role. 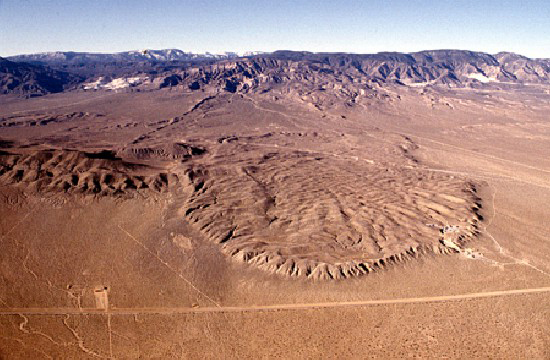 A long history of impacts, without resurfacing from other geological process, would lead to a largely unconsolidated surface. The surface therefore has marginally stable slopes that can be triggered to fail over time – most likely triggered by impacts elsewhere on the body. Typical height:length ratios of landslides on Iapetus lie between 0.1 and 0.3. On the lower end, this is analogous to terrestrial submarine landslides and mudflows; the upper end is comparable to small subaerial rock avalanches on Earth or large landslides on Mars. The coefficient of friction is lower than expected for ice (which is approximately 0.55-0.7). These data indicated that the frictional properties of the Iapetus landslides were reduced. Many theories have been proposed for a reduction of friction in large runout landslides (e.g., acoustic fluidization, mobilization on an air cushion). 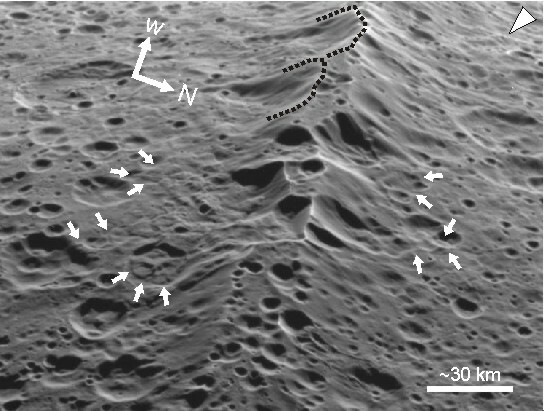 The mechanism proposed for Iapetus is flash heating along the base of the landslides. This process produces a concentrated amount of heating; not enough to melt ice, but sufficient to increase lubrication and make the ice more slippery. Earth and a small icy satellite such as Iapetus may seem very dissimilar, however many of the same geomorphic processes are observed. A better understanding of the long landslides on Iapetus may help us to understand the causes of similar catastrophic events on our own planet. Dombard, A.J., Cheng, A.F., McKinnon, W.B. 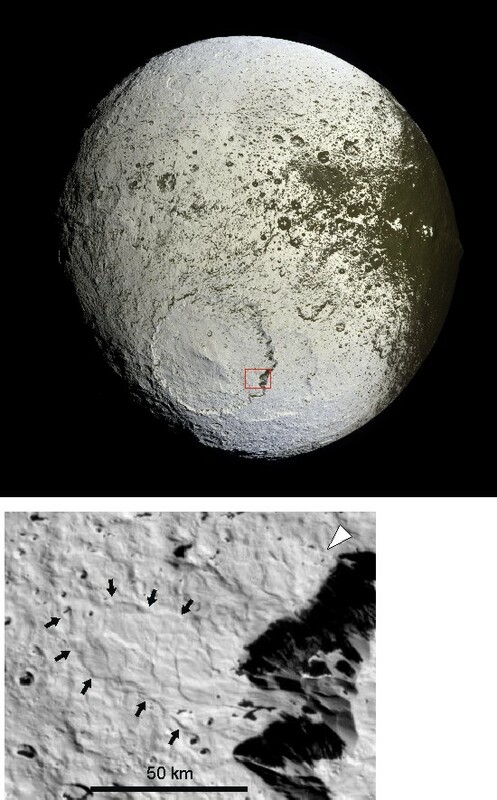 & Kay, J.P. (2012) Delayed formation of the equatorial ridge on Iapetus from a sub-satellite created in a giant impact. J. Geophys. Res. 117, 03002. Moore, J. M. et al. (1999) Mass movement and landform degradation on the icy Galilean satellites: Results of the Galileo Nominal Mission. Icarus 140, 294–312. Singer, K.N., McKinnon, W.B., Schenk, P.M., and Moore, J.M. (2012) Massive ice avalanches on Iapetus caused by friction reduction during flash heating. Nature Geoscience, 5, 8, pp. 574 – 578. McEwen, A. S. (1989) Mobility of large rock avalanches: Evidence from Valles Marineris, Mars. Geology 17, 1111–1114. Quantin, C., Allemand, P. & Delacourt, C. (2004) Morphology and geometry of Valles Marineris landslides. Planet. Space Sci. 52, 1011–1022. De Blasio, F. V. & Elverhøi, A. (2008) A model for frictional melt production beneath large rock avalanches. J. Geophys. Res. 113, F02014. Di Toro, G. et al. (2011) Fault lubrication during earthquakes. Nature 471, 494–498. Goldsby, D.L., & Tullis, T.E. (2011) Flash heating leads to low frictional strength of crustal rocks at earthquake slip rates. Science 334, 216–218. Rosenberg, R. (2005) Why is ice slippery? Physics Today 58, 50–55. Melosh, H. J. (2011) Planetary Surface Processes. Cambridge Univ. Press.